Earlier today, we told you that the new Android L keyboard was released for rooted KitKat devices thanks to someone at the XDA. Now, the keyboard is available as a separate download via Google Play, and it works on non-rooted devices, too. The Android L keyboard app was launched just hours ago by Shen Ye, who himself is an XDA TV producer. We’re not sure if it’s compatible with Android Jelly Bean devices, but it certainly works with those running KitKat (we tested it). Update: it should be compatible with any device running Android 4.0 or later. After you download the Android L keyboard, follow the instructions from its Google Play description to use it. The new keyboard doesn’t feel too different from the standard KitKat keyboard, but it does look nicer - at least in our eyes. The keyboard is part of the Android L developer preview that's been made available only to Nexus 5 and Nexus 7 owners. Let us know if you’re downloading it (from the source link below), and if it works as you’d expect after the installation is complete. lol "why is there a wc emoji here?" Except that IF Google allowed devs to create 3rd party themes for a keyboard. I agree...i have an Xperia and the key works the same to me, if not better. Just that Swift key has more customizable options. And i don't "fancy" that. Nope, tried Swiftkey a year ago -> Laggy, Unnecessarily bloated. Tried it again this year when it went Free -> Still laggy, still unnecessarily bloated. Did the same thing you did. Have to get used to where things are on the keyboard, but what I don't like is how it adds spaces between words when you're swyping in a web browser address bar whereas there are no spaces added when using Swype. Trying it out. Definitely a different feel with the new design theme. Hopefully they'll put this on iOS 8 I'd like to try it out. Love the new Material keyboard. Kthnxbi dumb Swiftkey. Isn't this the same keyboard as on the Asha 305-311? They had to make a new keyboard just to add one new theme? That's sad. This keyboard looks exactly like the stock keyboard on an N9 running Meego I've seen. OK, so, I've been trying for the last hour to get this keyboard. I have android KitKat and the Google Keyboard. However, when I try to change the layout, I am only allowed to change the color of the gesture trail and word suggestion. The keyboard itself continues to look the same. excuse me. someone help me. 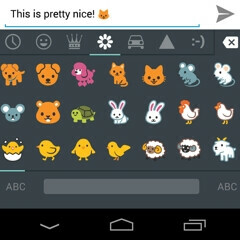 i installed on my Galaxy S4 with KitKat but, there's no emo icon on my keyboard? any other setting or ?? thanks before.